3. direct tethering of a receptor to a scaffolding protein (for review, see Reference 76), which is per se directly or indirectly linked to the cyto-skeleton (Fig. 4.3 c). These mechanisms are readily grasped by intuition and they can actually be shown to operate on GPCRs: single dye tracking reveals that the trajectories of receptors are limited to small areas for prolonged periods of times, suggesting that a given receptor is confined to a small compartment; however, there are instances where the receptor can apparently switch compartment by an event, which is referred to as hop diffusion . It is worth noting that agonist stimulation of many GPCRs is predicted to affect the apparent rate of diffu-sion—in particular to increase the probability of hop diffusion. Several mechanisms can be envisaged: upon agonist binding, receptors may signal to the P isofoms of phospholipase C either by (1) generating GTP-bound Gaq family members (Gaq/11/14/15/16) or (2) by liberating enough free GPy dimers. Activated phospholipase C will consume PIP- (phosphatidylinositol-4,5-bisphosphate) and thus reduce its availability. This phospholipid is essential for recruiting many actin-binding proteins (e.g., ezrin, radixin, moesin—via their FERM domain; N -WASP via a polybasic motif) to the inner leaflet of the plasma membrane. 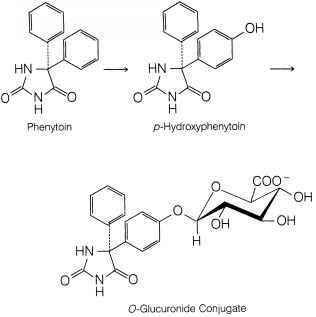 (3) GPy dimers may also activate the y isoform of PI3-kinase, which again consumes PIP2 (to generate PIP3 , phosphatidylinositol - 3,4,5 - trisphos-phate). Again, this causes redistribution of cytoskeletal proteins and scaffolding proteins (which may interact with PIP2 and/or PIP3 via their pleckstrin homology domain). (4) Activation of G1 2/G13- coupled receptors engages an exchange factor of the p115RhoGEF family, which relay the signal via the small G protein RhoA to the actin cytoskeleton. Last, but not least, the actin cytoskeleton has been proposed to stabilize specialized lipid domains, which arise from the different miscibility of lipids [78, 79] and which are commonly referred to as lipid rafts (see below). Figure 4.3 Mechanisms for local confinement of GPCRs. (a) "corralling/fencing model": a GPCR (indicated as dark grey, U-shaped rectangle) is restricted in its mobility (indicated with arrows) within the phospholipid bilayer (shown in light grey) by membrane-bound actin filaments (indicated as grey cylinders). Actin is attached to the membrane via FERM domain proteins (F for 4.1 protein, E for ezrin, R for radixin, M for moesin; shown as grey "M"-shaped rectangles). These bind PIP2 (phosphatidylino-sitol 4,5 bisphosphate; shown as small dark oval) embedded in the inner leaflet of the plasma membrane. (b) "fencing/picketing model": the GPCR is restricted in its mobility by transmembrane (TM) proteins (indicated as big dark oval), which proteins are attached to the membrane-bound actin complex (PIP2/FERM protein/actin complexes) via their associated PDZ domain-containing scaffolding proteins. Lateral motion causes the GPCR to collide with the other TM proteins or the lipid shell surrounding these. 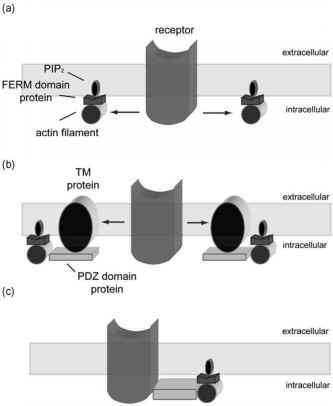 (c) spatial confinement by direct interaction: a receptor is restricted in its mobility within the membrane by direct binding to a scaffolding (PDZ domain-containing) protein which is tethered to membrane-bound actin filaments. for a concentration of signaling components and thus speed up signal transmission. The most efficient means of concentrating signaling components, however, is the binding of GPCRs, effectors, and regulators to scaffolding proteins. The paradigmatic example is the InaD mutation which greatly limits signaling by rhodopsin in the drosophila eye (hence the acronym, Inactiva-tion No-After Potential-D) . The affected gene encodes a scaffolding protein with 5 PDZ domains, which assembles rhodopsin, phospholipase C (insect rhodopsin signals via Gq), protein kinase C, the TRP channel (a nonselective cation channel; TRP = transient receptor potential), and other components into a large complex, termed signalosome or signalplex (for review, see Reference 81 ).